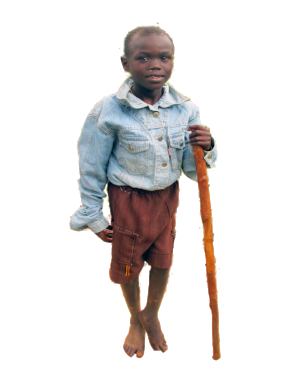 Two years ago, Orphan's Lifeline International provided Benjamin with a surgery to correct a hip and leg injury he received when a car hit him on his bicycle. Benjamin could barely walk when we learned of his plight. Now he can run and play with the best of them! You can read his story. Now there is a new opportunity to help Benjamin! Benjamin is 1 of 25 children we have identified that were living on the streets... in the slums...not far outside of Nairobi. These children have some of the most heart-breaking personal stories we have heard in all of the 17+ years we have been helping orphans. Right now we are feeding them on the street where they live...we want to give them a HOME. Today, you can choose from the options below that will make it possible for Orphan's Lifeline International to get a new children's home up and running for Benjamin and his friends. This will forever change the lives...of 25 innocent children who desperately need our help! Startup costs for this home are approximately $10,000.00 which includes all beds, bedding, kitchen supplies, furniture, hygiene products, clothing, absolutely everything needed to put these 25 children in a warm and loving home. Since this is a home, we are going to call the units of measure for this donation a "brick". That's it, scroll down and start shopping for the size of brick you want to donate and then the number of bricks you want to donate. All founding donors for this startup fund will receive a picture of their name on a plaque that will hang on the wall of this children's home. All donations are tax deductible as allowed by law. Orphan's Lifeline is a 501(c)3 non-profit organization. FED-ID 81-0530827. All donations that exceed the start-up costs will be used to provide daily care for the children in this home.